On March 27, 1939 the first NCAA Tournament was born and with it came the social phenomena of March Madness. Originally only having an 8 team format, the tournament has evolved into a 68 team campaign for the Championship. Since its inception 35 different teams have won the “Big Dance” with UCLA leading the pack with 11 titles followed by Kentucky at 8. UCLA won 10 of its 11 tittles behind the reigns of Coach John Wooden between 1964 and 1975. Though no one knows for sure when filling out brackets for March Madness first became popular, the rise of the Internet in recent years has exponentially increased the amount of brackets completed and the popularity of this competition. This has led to networks like ESPN and Yahoo to have a nationwide competition awarding people for the best brackets. Most notable of these competitions, is this year’s Warren Buffet and Quicken Loans Billion-Dollar Challenge. 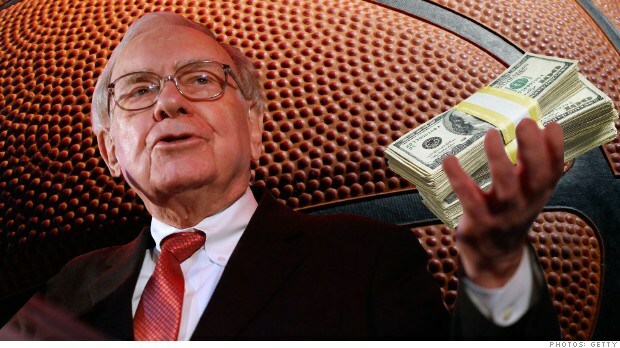 The challenge is simple: select a perfect bracket, win a Billion-Dollars. Now as simple as this sounds, the odds are against you. You have a 0.000000000000000005421% chance of picking a perfect bracket if you randomly do every pick. That’s approximately less than One in Quintillion chance. You have a better chance of winning the lottery twice before you select that perfect bracket. But lets say you consider yourself an expert in college basketball and have a 90% chance of picking a game correctly. You would still have less than a one percent chance of correctly picking every game. Still feel like your bracket is “The One”? Good, me too. After looking through the results from every tournament three key findings were found and should be in consideration as you make your picks. Since they began seeding teams in 1979, a 1 Seed has made to the Final Four in every year with the exception of 1980, 2006, and 2011. Has either won its regular season conference title or conference tournament. Ranks in the top 20 in kenpom.com’s adjusted offensive efficiency ratings. Using data analytics is it possible to create a Predictive Formula using Data Analytics? Well the quick answer is no. Though it is very possible, as of right now no one has cracked the code. A lot of people are able to pick who will win or who will make the Final Four, but to come up with a correct prediction for every game is nearly impossible. There is just too much randomness. 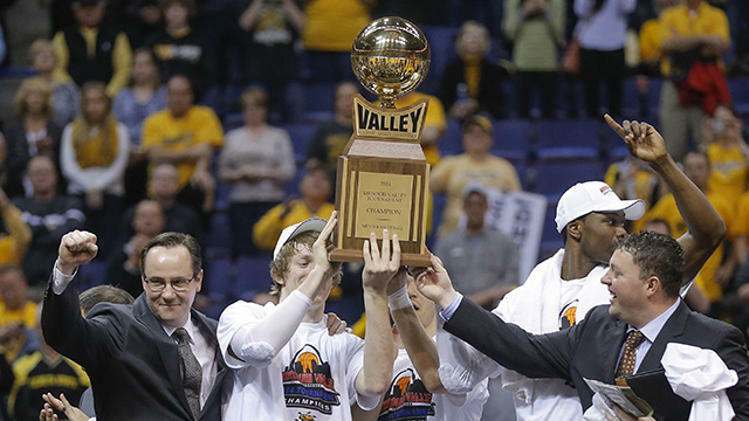 I decided to take a whack at this and try to predict the results of 2014 NCAA Tournament. 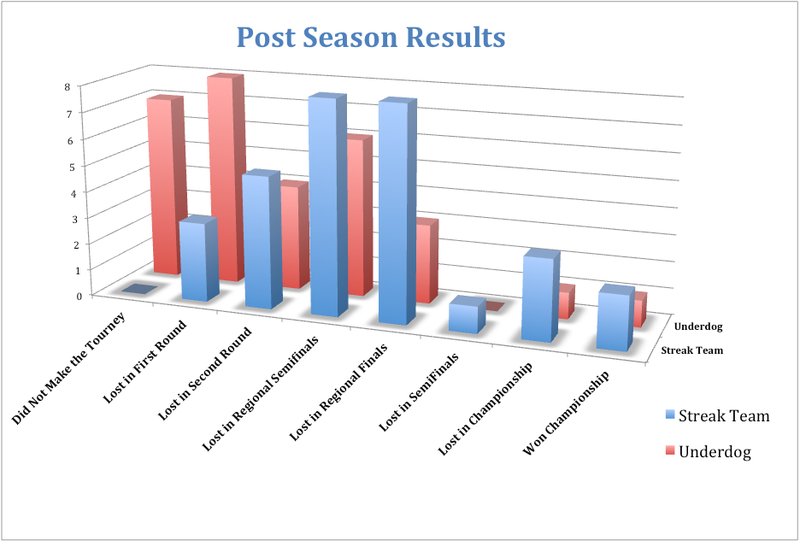 With some help, I collected the data starting from the 2006-07 season up to the most recent. Using each teams statistics during the regular season I ran a regression analysis to get each team down to one single number. After running the regression I found that a few statistics had to be rejected because they represented no correlation between how well a team will do in the Tournament. 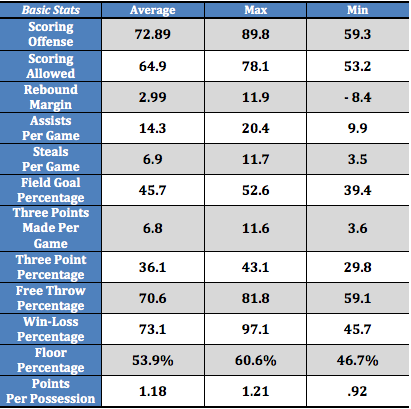 Some of those variables are: Rebound Margin, Assists Per Game, Strength of Schedule, and Points per Possession. If you have any suggestions about any article ideas or sports data that you would like me to analyze, feel free to contact me at billysbeanes@gmail.com . Special thanks to CamRondo (@CRJustice) and Megan (@BabichMegan) for helping with some of the data entry! At the college level, going undefeated is no easy feat in any sport. This is why since the beginning of the NCAA Mens Basketball Tournament in 1939, only twenty-four teams have finished the regular season undefeated. Only seven of which went on to win the Division I Championship. The last time a team went undefeated in the regular season was the UNLV Runnin’ Rebels, in 1991, who eventually lost in the Final Four to Duke, the champions that season. The last team to go both undefeated in the regular season and ultimately win the championship was the 1976 Indiana Hoosiers. After twenty-three years we finally get to see another team enter the Tournament undefeated. That team is the Wichita State Shockers, a team that claims that they not only play with a chip on their shoulder every game but play angry. This angry play has led them to a historical 34-0 season. But somehow they are not ranked first overall in the AP Poll. Critics say that the strength of their schedule is weak, which is why it is ranked 102nd in the country. Throughout the season they only played one team in the top 25 and only two teams that are in the top 50. Though it is tough to bash on what they have managed to accomplish this season, their scheduling it is something that should be consider. But, why don’t more teams go undefeated? 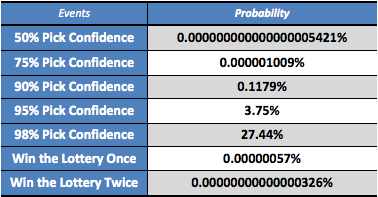 The answer lies in the probability of winning each game throughout the season. The basic approach is to say that each team has a 50% chance of winning that game. Then by using this logic and calculating it for the 34 games you see a probability of 0.000000023% . That’s a lot of zeros. Now, you may be thinking to yourself that some teams are just better than others and thus have a better chance of winning each game. Lets assume that a team is pretty good and has an 80% chance of winning each game. This calculation results in them having a 0.079% chance of going undefeated. Meaning that less than 1 out of every 1,000 teams at this level would go undefeated. Well what if you have an all-star team that has a 95% chance of winning each game they play during that season. The results are that they would only have a 19.4% chance of winning every game over the course of that season. 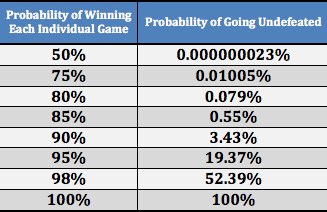 When we think about the probabilities associated with winning every game, even for elite teams, we begin to see why this is such a rare accomplishment. This table depicts the probabilities of winning 34 strait games. So now lets Look at the data from the teams that may not have had that perfect season but at one point were on their way. The data included teams from the 2000-01 to 2012-13 seasons that had at least 15 wins (about half way there) before their first lost. This resulted in a sample size of 30 teams. Below are the basic statistics of those teams. Now lets look at the data from the underdog, streak stopping, teams that put that first blemish on that potentially perfect season. 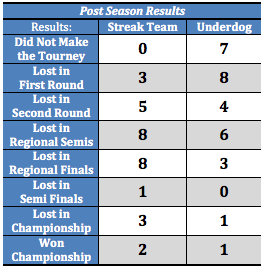 With NCAA Tournament and March Madness right around the corner it is only appropriate to next look at how well both these Streak and Underdog Teams did in the Post Season. From looking at the data the first thing you see is that all of the Streak teams made the tournament with the majority of them making it to the Regional Semi Finals or Regional Finals before losing. We also see that one of the teams made it to the Final Four and lost, and five made it to the Championship game resulting in two of those teams winning the whole thing. A statistic to think about here is that out of these 30 streak teams only two of them won the whole thing, giving an estimated probability of 16.6% chance of a team that goes on at least a 15 game win streak to end up making it to the finals and a 7% chance that they will end up winning the whole thing. Remember that this is only a rough estimate because the data only includes teams from the 2000 season on. Now when we look at the underdog teams we see a different story. Seven of these teams did not even make the tournament and when they did make the tournament the majority, 8, of them lost in the first round. Two cases in particular to look at are those of the 2011-12 Kansas Jayhawks who made it to the finals before losing, and the 2003-04 UConn Huskies who went on to win the whole thing. This gives us some rough probabilities: probability they don’t make the tourney 23.3%, probability they lose in the first round 26.7%, probability they make it to the finals 7%, and the probability that they win the whole tournament is 3%. Out of curiosity, I took all of the data from the games that these streak teams were upset by the underdogs. 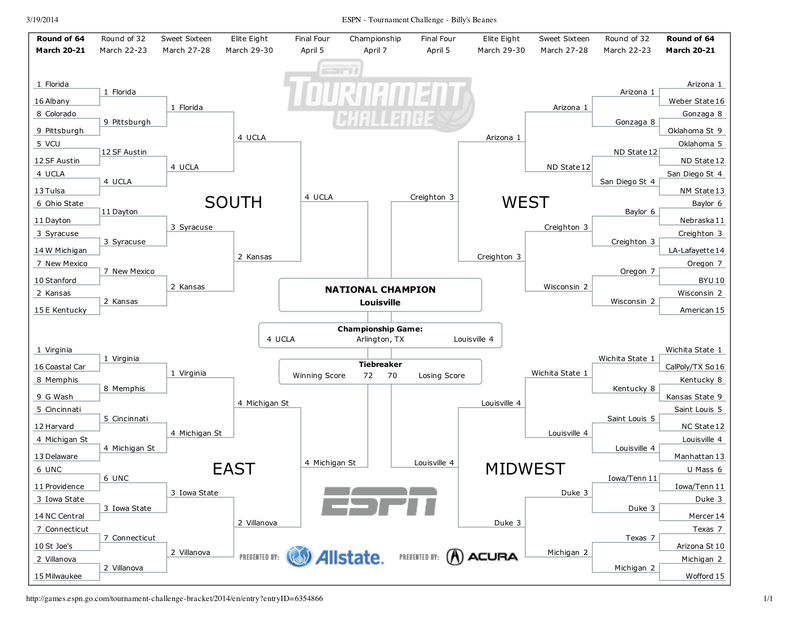 I analyzed this in order to make a prediction on which team should have beaten the Wichita State Shockers this season. Based on results, the majority of the teams were away when they lost so it is fairly safe to say that if Wichita was going to lose it would have been on the road. Next, I looked at the opponent’s win-loss percentage. Excluding the outliers in the data, for the most part the underdogs had around a 75 to 80% win-loss percentage. Overall most of the games were close and settled within a few points, so that should be factored in as well. Thinking about this criterion and looking at the Shocker’s schedule this year five games appear but one game in particular really stands out. Their 8th game of the season, on the road, against the St. Louis Billikens. St. Louis led the first half 29 to 28, but were trump in the second as Wichita State pulled away to win by five. St. Louis just ended their season with a 26-5 record and have secured a spot in the tournament. Now, it isn’t fair to discredit anything Wichita has done this season, but if they were going to lose a game it would have most likely been this one. Regardless of Wichita State’s schedule, or what the critics may say, this is still an incredible achievement for them and will surely put them in the record books. Over the next couple of weeks we will truly see if this team deserves to have that number one spot, and whether or not they will join the other seven historically elite teams that continued their undefeated season all the way to the championship. NHL: Are Scouts and GMs Effective at Drafting Goalies? NFL: What Factors Effect How Much a Quarterback Gets Paid? NFL: Is the 40-yard dash a good predictor for NFL Wide Receivers?